Linda Shenton Matchett: Forensic Friday: Can You Smell That? Dogs and humans are different. You probably already knew that. But did you realize just how different we are? Think about it. Humans primarily use sight as the way we process the world around us. Dogs, on the other hand, use their sense of smell to interpret their experiences. Do you own a dog? What happens when you come home? My Boston Terrier, Ben, immediately jump off the couch and sniffs my pants and my shoes. If I bend down to greet him, he sniffs my blouse, face and any other area he can reach. If he could talk, he’d tell me exactly what I had been doing all day. How is that possible? Well, a human has about five million scent glands as compared to a dog who has anywhere from 125 to 300 million scent glands. Therefore, a dog’s sense of smell is 10,000 to 100,000 times better than our own. According to James Walker, former director of the Sensory Research Institute at Florida State University, "If you make the analogy to vision, what you and I can see at a third of a mile, a dog could see more than 3,000 miles away and still see as well." I don’t know about you, but that is mind-boggling to me. According to searchandrescueassist.org, dogs have been doing search and rescue for three hundred years. It all began with the St. Bernards of the Monks of the Hospice in the Swiss Alps. 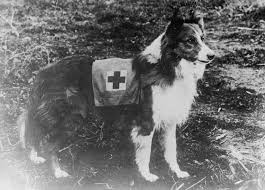 The dogs were trained to locate travelers who had become stranded or lost in winter storms while crossing the passes between Switzerland and Italy. Search and rescue dogs can be broken into two categories: air-scenting dogs and trailing (or tracking) dogs. Air-scenting dogs primarily use airborne human scent to home in on subjects, whereas trailing dogs rely on scent of the specific subject. Specific applications for search and rescue dogs include wilderness, disaster, avalanche, drowning, and cadaver recovery. Cadaver dogs can locate entire bodies (including those buried or submerged), decomposed bodies, body fragments (including blood, tissues, hair, and bones), or skeletal remains; the capability of the dog is dependent upon its training. In the United States a volunteer civilian organization, Dogs for Defense, helped convince the military to use dogs by training sentry dogs for the military to try out. In 1942 the Army authorized DFD to train 200 sentry dogs. Later the military took over the training, and DFD was appointed the sole procurement agency for the Armed Forces. Dogs were trained as sentry dogs, message carriers, sled dogs in the Arctic, and scout dogs. Not surprising that dogs are referred to as Man’s Best Friend! Got a favorite dog story to share? I’d love to hear it.